I was flipping through previous blogs this morning and noticed the one I wrote on August 14 entitled “Fail Britannia!” where I noted how many of the top institutions on Wall Street (including the now defunct Lehman Brothers) said that shorting the British pound was the currency trade of the year. I haven’t paid much attention to the currency markets for a while so I thought I’d follow-up and see if this prediction made by the big dogs actually panned out. Below is a table of currency ETFs along with their associated gains or losses from August 14, 2007 to today. Note that the middle of August was the time when most of the major currencies had either broken overhead resistance (the USD) or had broken below major support (most other currencies except for Japan). You can see that shorting the market would have produced a better return than shorting the pound, although shorting the pound would have produced a great return bested only by the Mexican peso, the Swedish krona, and the Australian dollar. US Dollar: Most of the European currencies rallied last December in conjuction with the greenback’s drop. However, the dollar is making a comeback. It’s trading today near $26; it faces strong resistance at $27. If it breaks that, then the sky’s the limit. Japanese Yen: After its strong run-up, the yen has been challenging its all-time (ETF) high of $144.50. It has strong support at $105 and a break in either direction would be likely to continue. Mexican Peso: Things are not looking good for the poor peso. It hit a new all-time low today and its chart is looking grim. The Euro: After its December rally, the euro has been on the skids. A break of its previous $124.70 support level would signal further deterioration. Right now is a good time to just sit back and watch. I’d wait until a support or resistance level is taken out before jumping in. Note that all of these ETFs are optionable, but beware as some are very thinly traded. In my blog on April 29, 2008 (“Post-takeover announcement plays“), we looked at the results of buying the stock of companies that are being acquired on the date of the takeover announcement. We saw that out of 62 companies that announced takeover bids between March and July of 2007, fifty-seven of the deals were successfully completed, two had failed, and three had not closed as of the time of writing. (I haven’t gone back to the original data to see what happened to these last three deals.) The average return was 2.9% and the average holding time was 2 ½ months, giving an annualized return of 8.7%. It is reasonable to expect M&A activity to be sharply curtailed during times of lean credit and that, too, is born out by the data. During the bull market sampling period, M&A activity averaged about a dozen deals per month; during the past half year that figure was cut in half. One thing that did remain the same, however, was the average length of time between announcement of the acquisition and deal close—two and a half months with a standard deviation of a month. To me, the most remarkable statistics are the fact that although we’ve been in a ferocious bear market with tight credit for the past half year especially, deals were made with a surprisingly smaller number of failures than I would have expected. Hopefully, President Obama’s plans to revive the economy and free up credit will stimulate an increase in M&A activity. Though I was incommunicado last week doesn’t mean I wasn’t active in the market. Last Thursday (Jan. 22) I picked up some Puget Energy (PSD), a Washington state based utility, for $28.90. On December 31, Washington state regulators cleared the way for the company’s acquisition by an Australian private equity group. The acquisition is an all-cash deal of $30 per PSD share plus dividends and is expected to close on February 6. The company will by paying a quarterly dividend on February 15 to shareholders on record as of January 21. I don’t qualify for that one but I will be receiving an extra dividend of $0.04448/share assuming the deal closes on Feb. 6. This represents a 4% return on investment giving a 97% annualized return. Not bad! This raises some interesting questions: Will the deal get done? Will it be delayed but still go through on the same terms ($78/share in cash) or will the offering price be lowered? At this point, I don’t think anybody can accurately predict the outcome but I do think something will happen soon as Dow is paying through the nose for each day of delay. I’m still holding the position in MANDA because frankly I’m not sure what to do. I’m glad, though, that writing the ROH Jan 50 Put @$3.00 panned out as it eased the pain of the loss, at least in my own portfolio. (I didn’t write the put in MANDA since options are not part of the strategy, but that might change.) Too bad I didn’t write the February 50 put yesterday as I could have gotten $2-$3 for it, but now might not be a good time for further speculation, anyway. Note: Updated MANDA holdings will be shown after this article. An unsolicited bid for Forestar Group (FOR), a company principally involved in residential real-estate with minor interests in gas and oil royalties as well as the sale of wood fiber from its undeveloped land, was made by timber baron Holland M. Ware last Thursday, Jan. 22, for $15/share in cash. Based on the company’s outstanding shares as of Oct. 31, 2008, the deal is worth around $535.5 million. The board of Forestar said they would consider the offer. I was ready to pounce on this but took a step back when I saw that the stock of Forestar hadn’t risen much after the announcement—at least, not as much as one might have expected. On the first trading day post-announcement, the stock closed at $12.09, up 30% from the previous close but still 24% from its offering price. That’s alot. So, I did some quick research and came up with some reasons as to why investors may not be so thrilled with it. The other reason is because of his stock position in the company. As of 12/18/08, Ware is reported to own 2.35 million shares of Forestar stock representing 6.6% of the outstanding shares. Guess who owns nearly 10% of the company? Mega-investor Carl Icahn that’s who (3.5 million shares as of 9/30/08). What I’m wondering is if Icahn along with other stockholders and company officers and directors will be willing to tender their shares at a loss. Would you? Before the end of last September, Forestar stock had never traded below $15 as you can see from the weekly chart below. Of course, the real-estate market may not recover for a while so in that respect this deal may offer some luke-warm appeal. As for me, I’m staying away from it. Many apologies for my recent absence. I came down with a severe case of writer’s block—I just couldn’t seem to be able to put anything into words. This malady has stricken me before but this time was one of the worst. But now the cloud is lifting and (hopefully!) I will be solidly back on track. There’s a backlog of topics I wish to cover but I feel that talking about current market conditions is the most pressing at this moment. 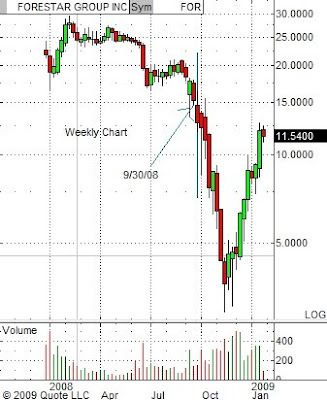 A head & shoulders (H&S) pattern began forming in the latter part of 2006. The pattern ended in mid-2008 with the breaking of the right shoulder at 12200. Technical analysis tells us that we can expect a continuation in downward momentum of at least 1800 points (the distance from the neckline (12200) to the top of the head (14000)) to the 10400 level. You can see from the chart that this is a strong area of price support. Unfortunately, this level was broken last October. For the past several months, the price has been oscillating between 8000 and 9000. If it breaks above 9000 on heavy volume, chances are good for a continued rally. On the flip side, a break below 7800 should serve as an alert for continued downward movement; a break below lower support at 7500 and the bears will really have a field day. Aside: There’s also an inverse head & shoulders pattern that began in 2001 and ended in 2005 with the neckline at 10800 and the head at 7500. This gives an expected point rise of 3300 points (10800 – 7500) to a level of 14100 (10800 + 3300) which is indeed where the Dow ended up before turning right back around. 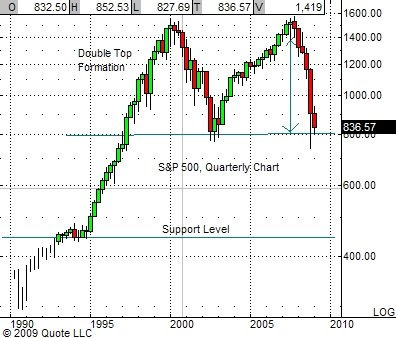 The quarterly chart of the S&P shows a distinct double top formation. This pattern was over 10 years in the making. The neckline is at 800 with two peaks just over 1500—a 700 point difference. Unfortunately for us, a double top has similar implications as for a head & shoulders formation which means that if the price breaks through the current neckline level, we could be looking at a catastrophic fall to 100. The fall could be mitigated by the support level at 450, but let’s keep both fingers crossed that this scenario will not pan out. 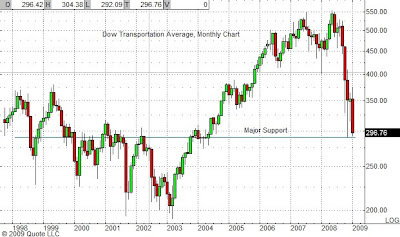 The Dow Transports are considered by many to be an early indicator of market direction. 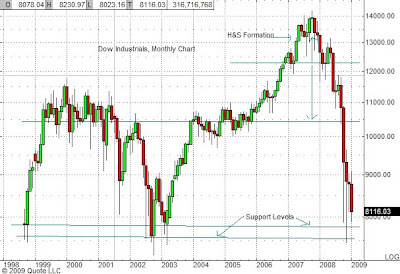 Its monthly chart shows that it’s rapidly closing in on major support around 290. If it breaks through that, we could be facing another 100 point drop to its 2003 low at the least. These charts of the major market averages are showing us two things. The first is that to glean an accurate picture of market conditions we need to look at charts over multiple time frames. The second is that the indices are all poised at critical support levels and should these levels not hold, we could be facing a massive breakdown of Titanic proportions. Is the other shoe about to drop? According to a December 14, 2008 segment of 60 Minutes entitled “The Mortgage Meltdown,” we are apparently in the lull of the first half of the mortgage crisis. The first shoe to drop was the $trillion+ write-downs due to defaults in the subprime mortgage sector. The good news is that most of the air has already leaked out of this bubble, but the bad news is that another, perhaps more sizable, bubble is beginning to form. This new bubble is composed of more esoteric types of mortgage instruments, the so-called “Alt-A” and “option ARM” mortgages. (See below for a brief explanation of each.) Credit Suisse estimates this bubble to be roughly the same or even slightly larger than the previous one. Defaults are expected to kick-in now and ramp up rapidly through the next two years peaking in the summer of 2011. If this gruesome scenario pans out, I don’t think a depression is out of the question. But this next bubble may not turn out to be as bad as projected. According to several realtors who posted their opinions on blog threads about this news segment, some of these mortgages have already been priced into the subprime bubble. But don’t get too optimistic because the general consensus is that the worst is still far from over. Assuming we have any money left with which to invest, the question is: How can we profit from this? Obvious choices are long-term bearish plays on any of the major indexes (DIA, SPY, etc. ), the banking sector (XLF), the home builders and home construction (ITB, XHB, PKB), consumer discretionary (PEJ), retail (RTH). [Corresponding ETFs in parentheses.] It seems as if a paradigm shift in our saving and spending habits (more saving, less spending) is in process and anything that addresses this shift could be investment-worthy. People will be moving and needing a place to store their stuff. The next coming wave of foreclosures could well be a boon for the moving and storage companies: Ryder (R), Amerco (you know it as U-Haul) (UHAL), Public Storage (PSA), Sovran Self Storage (SSS), U Store It (YSI), and Extra Space Storage (EXR). The last four companies operate as REITs and as such pay dividends; Sovran and Extra Space sport dividend yields of 9.3% and 10.6% respectively. Although not a REIT, Ryder does pay a dividend (2.7%). Less money means people will be electing to fix up their cars rather than trading them in for new ones so a case could also be made for auto parts suppliers such as Autozone (AZO), Advance Auto Parts (AAP), O’Reilly Automotive (ORLY), and Pep Boys (PBY). Of this group, Autozone has been kicking the competition’s butts. Its stock is looking to test its $140 all-time high for the fourth time. Manny, Moe, and Jack, however, need to tune-up their operations. 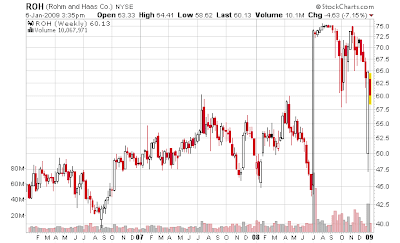 Their stock is sitting near its historic low of $3 but on the bright side, it does pay a dividend of nearly 8%. A similar argument could be applied to the home builders but then again what they gain in DIY home repair projects could be offset by projects lost to new housing construction. I’m definitely no expert on this one. The above is but a tip of the iceberg of possible plays. As always, do your own due diligence before investing. The above speculation is based on the opinions of a few people interviewed by 60 Minutes. In the interest of full disclosure, I have to say that I’ve always regarded that program’s journalistic integrity. Although I have no evidence to the contrary, I do feel as if they slant their segments to emphasize one side of the story–theirs. But even if their predictions presented in “The Mortgage Meltdown” were exaggerated, I don’t believe they’re false and neither do most of the real-estate professionals who have seen and commented on it. I think it’s only wise and prudent to be prepared for more fiscal pain. Nationalization of the banking and financial industry could well become a reality. Alt-A and Option ARM Mortgages: Alt-A mortgages fall between the prime and sub-prime loan requirements; they’re riskier than the former and not as risky as the latter. Option ARMS are insidious types of loans whereby an ultra-low payment rate (also called a “teaser” rate and often around 1%) is offered initially. The loan resets after a specified period of time (usually 5 years) and depending on the terms of the loan, the rate can go up dramatically. These loans have an inherent negative amortization component and it’s entirely possible that the loan principle can exceed the value of the property. These loans are hallelujahs for house flippers in rapidly rising real-estate markets. In declining markets and in rising interest rate environments, you can easily lose your shirt. I’ve been slaving over a blog which I’ve been hoping to finish each day, but just when I think I’m done I find something else to add. The process has been much slower going than I had hoped so my apologies for the lack of blogs this week. (I also have to admit to taking some much-needed time off, too.) However, in the course of my investigations, I discovered an incorrect entry in the MANDA portfolio table: I purchased Bluegreen Corp. (BXG) on July 22, not July 2. The only difference this makes to the numbers is in the calculation of the annualized return. MANDA tables from here on will be corrected. The table below shows today’s addition of Aladdin Knowledge Systems (ALDN). Update 1/15/09: Please note that the entry date for BXG is incorrect: it should be 7/22/08 instead of 7/02/08. Future tables will be correct. The New Year is ringing in with a bit of a surge in M & A activity, much to my delight. My MANDA fund holdings have been drying up and today I’m pleased to make a new addition to it: Aladdin Knowledge Systems (ALDN). Here’s a summary of the proposed transaction from Barron’s Online: “Aladdin Knowledge Systems (ALDN) an Israeli-based security software company, this morning announced that it has agreed to be acquired by an investor group led by private equity firm Vector Capital in a deal valued at about $160 million. Aladdin holders will receive $11.50 a share in cash, about a 20% premium to Friday’s closing price, and a 64% premium to the closing price on January 5, when Aladdin announced that it was in talks with Vector on a possible deal. Vector Capital said it will place Aladdin’s DRM and authentication assets under common management with another one of its companies, SafeNet. The boards of both companies have approved the deal and Wells Fargo will be providing debt financing to support the acquisition. The merger is subject to the approval of Aladdin’s shareholders as well as the usual antitrust regulatory approval. I picked up the stock today at $10.92. This represents a 5.3% return on the transaction for a 20-30% annualized return, depending on when the deal actually closes. Earlier today Abbott Labs (ABT) announced that it will be buying Advanced Medical Optics (EYE) for $22 per share in cash in an effort to expand Abbott’s medical footprint into the laser vision correction and eye care arenas. The merger is expected to be completed before the end of the first quarter. This deal is yet another example of cash-rich big pharma buying up those quality smaller firms that have been badly beaten down. Expect more acquisitions of this type to continue. I did not purchase EYE today because it traded above $21.48 which represents only a 2.4% return at best. Call me a pig but I’d like more. If the price drops to the low $21.20s I could be tempted into buying it. 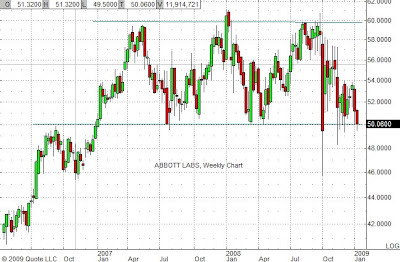 By the way, Abbott stock has been channeling between $50 and $60. (See chart below.) Currently, it’s sitting at $50 and if you’re into playing channeling stocks, as soon as the stock moves up a bit, I’d jump in. (For you options players, a bull-call 50/55 or even 50/60 debit spread would be a good move. 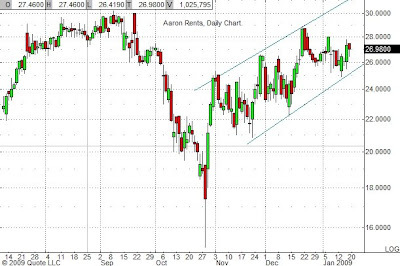 The reason I chose a spread over a straight call is that the spread mitigates the effect of volatility.) However, if the stock breaks $50 watch out below! The $50 level represents major support and if it violates that, then a short position is quite justified. Just a quick update to my M&A portfolio. All figures will be updated in the MANDA portfolio table either later today or tomorrow. Private equity firm Odyssey Investment Partners completed its acquisition of SM&A (WINS) on December 29th in a $6.25 per share all-cash deal. This represents an 11.4% return on the investment. On December 18th, Lincoln Bancorp (LNCB) announced a 7 cent per share dividend payable on January 15th to shareholders on record as of December 31st. The dividend was cut in half because of declining economic conditions and the desire to preserve capital, according to the company’s CEO. First Merchant’s (FRME) takeover of Lincoln Bancorp (LNCB) was completed on January 2nd. One share of LNCB was swapped for 0.7004 shares of FRME. The shares of FRME were sold today at a price of $22.91. This represents a 14.7% return without the dividends and 16.3% including dividends. I took advantage of the high options volatility as well as today’s slump in Rohm-Haas stock (ROH) and sold 2 January 50 put contracts (ROHMJ) for $3. Takeover company Dow Chemical (DOW) announced that it’s threatening to sue the Kuwaiti government for backing out of a joint venture deal whose monies were slated to be used in part to finance the Rohm-Haas acquisition. Dow has until this Saturday to complete the current $78/share all-cash merger with Rohm-Haas, and if Dow starts dragging its feet, substantial penalties will kick in. I’m sure the company will try not to make that happen. The put contracts are $10 out of the money. The $50 price level is about where the company was trading at in July before the acquisition announcement so I feel that all-in-all the risk here is limited. If not, then I’ll either buy back the puts or else be happy to have the stock put to me at $50. Most likely I’ll know where I stand come next Monday. NOTE: The ROH put was executed in my own portfolio and not in the Manda portfolio. However, buying a protective put when the stock fell below $70 would have been prudent and I can only say that considering this economic environment, it was my bad. I also should have done the same with Bluegreen as that was an overpriced deal from the get-go. I will try very hard not to make this error in judgment again. You are currently browsing the Stock Market Cook Book blog archives for January, 2009.